"What a long strange journey it's been ..."
Quayside Publishing once again expands its offering of large-format illustrated books--coffee table books--by reaching into the realm of rock-and-roll history. In the United States rock-and-roll, at least as music played by and for an audience of white people, began to grow into the public consciousness with Buddy Holly, Bill Haley and the Comets, and Elvis Presley, at least until the British invasion by the Beatles, Rolling Stones, and others. Then came Vietnam, and nothing was ever the same again. The Grateful Dead came together in that flower-power era, and in San Francisco, the heart of the counter-culture. The Grateful Dead became more than music; its name became shorthand for a worldview. Dead followers began to interact with the group in a way that reflected that alternative ethos, up to and including "Deadheads," camp followers who simply trekked to multiple Grateful Dead concerts over months or even years. It's no surprise then that communications with the group's headquarters began to arrive in fancifully decorated envelopes. 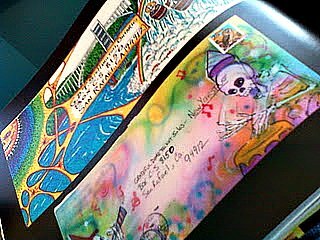 And so we have Dead Letters, nearly five hundred images, nearly all of them drawn by fans on envelopes containing ticket requests and sent to the band's headquarters. Chapter 7: Dead Head Characters: Come and Join the Party Every Day. Gruskin is a co-author of a Grateful Dead history published in 1983, and he has written other books about the place of art in rock-and-roll, including Art of Modern Rock: The Poster Explosion. Deadheads will want this book. As the basketball legend Bill Walton says in his forward to the book, "Dead Letters is essentially a love story--letters and all."